What would we do without this place in Crystal Palace? Especially those of us with kids? 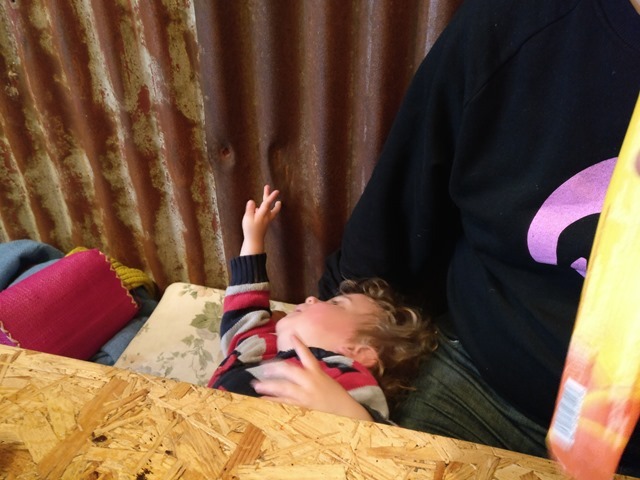 Honestly, there aren’t many eateries for people with chaotic, shouty offspring to go for a meal where you are NEVER judged for being audacious enough to eat out WITH YOUNG CHILDREN. Uptight person: “Honestly, how very dare you, most of the time? Your children should stay at home, learning French and sitting up straight, and you shouldn’t ever dream of having a meal out unless you subdue them with an iPad and headphones for the duration”. Well, not here thanks pals – at Brown and Green, the chaos, the unbending madness of your family is welcomed with open arms. And the food is bloody magnificent, I thank you. 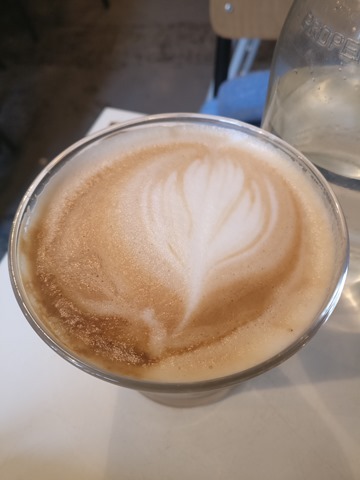 Ok, so if you don’t have kids, the sight of the cafe’s back room packed to the rafters with bog-eyed tousle-haired parents and their giddy, podgy babies and toddlers spiralling in all directions is enough to make you run for the hills. Or smoke a crack pipe. That’s ok – go somewhere else! Or move to the front room of the cafe that has less kids in it. To be honest, I really don’t understand those couples on their own who choose to sit near the families for their ‘quiet’ brunch out – seriously, why would you endure the chaos of dining near families if you could choose? In any case, for those parents who arrive struggling with the buggy, buggyboard, endless scooters, tiny filth-encrusted bikes, bags of shopping and overflowing holdalls containing nappies, damp half eaten bits of bread, mauled bananas and spare changes of tiny clothes – this back room is your haven. Just try to wedge all of your shite next to all the other family shite – on one count I saw about 15 buggies and various bits of apparatus squashed together in different parts of the room in the space of one sitting. Brunch was still served to everyone. Jeez Louise. It’s pretty noisy in here, but us parents are goddamned grateful to be out of the house! And the wonderful part? You never EVER feel judged. The staff are unfailingly gracious. They actually smile and do it with their eyes as well as their mouths! 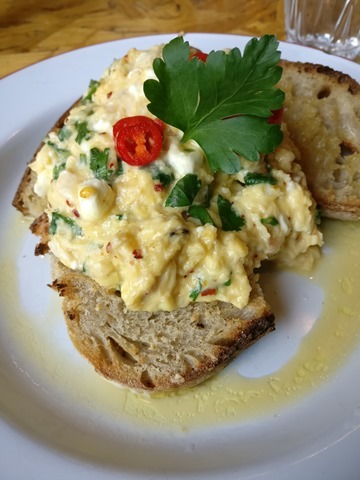 They swish through the room, expertly darting out of the way of 2-year-olds rolling around on the floor, or sidestepping 4-year-olds whirlwinding their merry selves around the tables without spilling a single drop of precious coffee or upending a tray of scrambled eggs. I don’t know how they bloody do it. And even if they swear inwardly at us feckless parents (I would) as they clear up all the detritus that gets left on the floor (half eaten bits of food, smashed crayons, smears of sauce) they don’t make it apparent. Seriously, they deserve the Ultimate Award For Being Nice And Patient. I apologise for all the rubbish that my kids have flung around the room. And the ketchup handprints my son has left on the window. And the food. Magnifico. 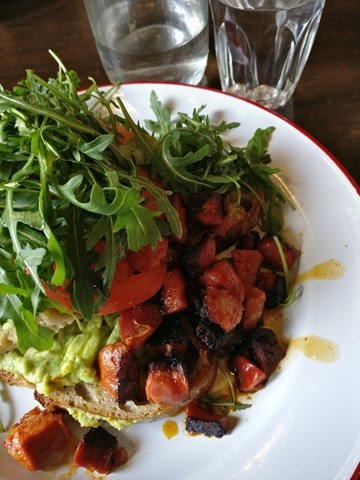 Innovative yummy brunchy things with avocados, chorizo, eggs, salads, good, craggy bread – all delicious and fresh and beautifully cooked. They use mountains of fresh herbs and salads draped all over the plates. Toasties have the correct tangy-strength mature cheddar, not bland ‘filler’ cheese that tastes of f*ck all. Industrial powered coffee. 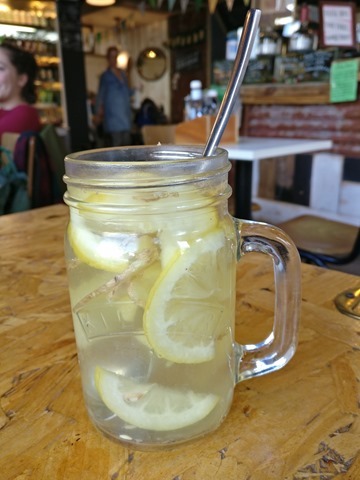 Fresh ginger and lemon feature in the hot toddy – not just a boring old teabag. Quirky flavoured granolas from Rock My Bowl. And so on. 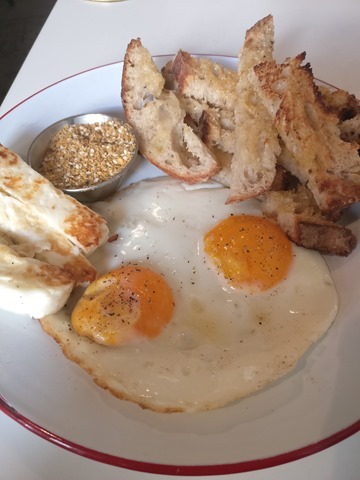 The food is thoughtfully sourced and put together. I even come here on my child-free days to work (with my headphones on and industrial bleeps playing if I need to concentrate) as the atmosphere is warm, lively and all-inclusive. Dogs can come too! Parental petrol: the coffee is good and strong! It sounds like heaven! Chaotic heaven. Ah you’d love it here Phil. All the chaos, all the food!